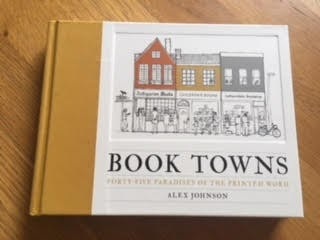 I was given the lovely Book Towns by Alex Johnson when I reached a certain age by one of the kids. Turns out my mid-life crisis is not to get a motorbike or do the Marathon des Sables but rather to tick off visits to book towns. 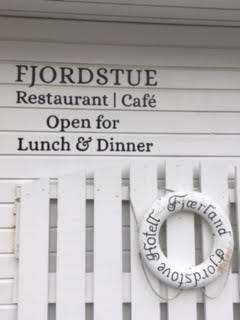 Most recently I visited Fjaerland in Norway. This is not a place you just pop out to. But I like to earn my ticks so I went from Bath via YALC at Olympia, Heathrow to Oslo, train to Myrdal, mountain railway via Kjosfossen Waterfall to Flåm, boat to Balestrand, and finally smaller boat to Fjaerland on the Sognefjord, in the shadow of the Jostedalsbreen glacier. I suspect there may have been a quicker way but my way was worth it for the breathtaking scenery on the journey. It was such a beautiful calming place. We had the best meal we had in Norway and the quirkiest room at the Fjaerland Fjordstue hotel with a stunning view of the colourful fjord. My purchases were limited as nearly all the books were in Norwegian. I have six words of Norwegian and I’m not even sure how to spell those but luckily I always like musty old books and looking at vintage covers and generally mooching about in old sheds. And, on reflection, since I’m incapable of visiting Hay-on-Wye without coming away with a bagful of books to add to the TBR pile, visiting only foreign book towns in future could be the way to go. 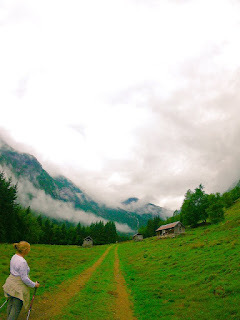 In short, Fjaerland was one of those places that’s good for the soul. 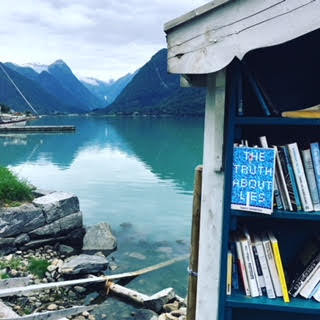 So when I am long gone and my current shiny debut The Truth About Lies is remaindered or pulped, I hope a copy finds its way down the fjords to Fjaerland to see out its days on a shelf with a beautiful view. Next stop…Wigtown or Buenos Aires. Really glad you enjoyed the book so much. That sounds like a great quest to have! What will be your next book town? Very tempted to book up staying/running the bookshop in Wigtown but massive wait for that. Anyone done it?